I couldn't help but set rather high expectations for 'The Usual Suspects' as I went into watching this. I knew this was no action movie or any of the crap we get nowadays. This was true cinema! 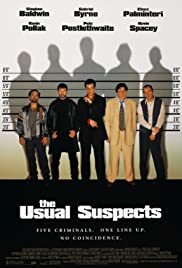 I was excited 'The Usual Suspects' is a mystery film about what cargo was on board the ship when it was destroyed and the events leading up to it as we are told from the only known survivor of that accident.